Tearable Monsters is all about creating fun, dynamic papercraft miniatures, terrain and accessories for tabletop roleplaying games like Dungeons & Dragons, Pathfinder, and any other games where you might want a little figurine of a terrifying monster to put on the table and know where your wizards fireball is going to go to see if its going to fry your barbarian friend whos also trying to hit it with his axe. We make 2d print and play paper miniatures that you can print out however many you want, as well as more 3d paper models in the future. Imagine being able to put your rogue on top of the dragons head and not have to worry about it falling off! Each miniature, terrain piece and other papercraft items will remain available to patrons for six months following its release to each tier, after which it will be retired from the patreon, and available for purchase as a bundle pack after that, usually in a themed arrangement, Like a Fiend Pack, a Ravenloft batch, and so on. The Cardboard Paladin Level will feature all Tier 1, Paper Wizard features, all Tier 2 Vellum Barbarian Features, as well as a copy of the original Gimp File layers for editing however they see fit, and coming up with their own modifications. In addition, patrons at this level may choose a 32x64mm or smaller creature or character for me to draw and release that month. For instance, you want a giant wombat? Well youre getting a giant wombat! While the design choices will be mine, if you want something special like a viking helmet on your dire butterfly, or a symbol of your pet boston terrier on a paladins shield thats totally doable. I do reserve the right to have you pick something else on anything innapropriate or offensive. Games will run around 4 hours and be run via discord. 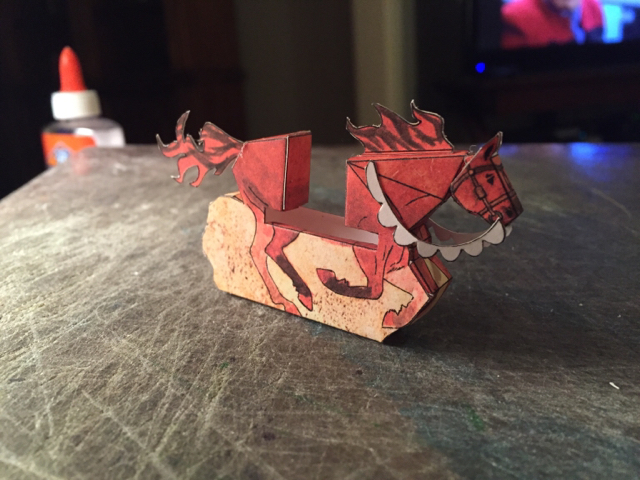 This rideable papercraft horse will be completed and available to patrons when we reach the $100 a month earnings goal. I will be adding a variety of realistic color layers to the pdf so you can ride whatever colored horse you want into battle. Also will be adding wings for those more inclined to ride a pegasus.